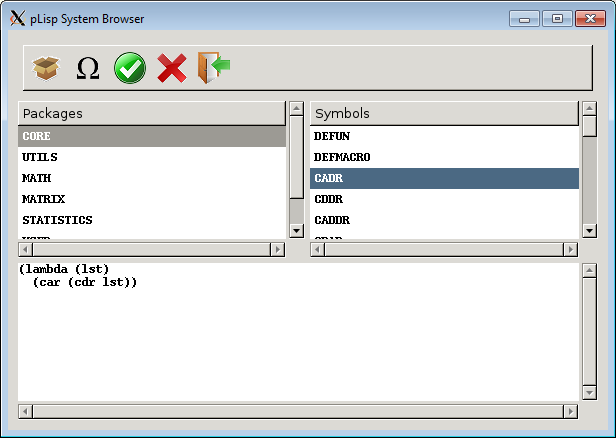 pLisp is now officially a GUI app. The code still contains #ifdefs to revert to console mode if required, but the results are decent enough to persist with this change. I zeroed in on GTK+ after dithering over this decision for a long time, and, while doing GUI development in a C environment without any handy things like drag and drop, WYSIWYG layouts, and so on is a bit of a pain, I think I've got the hang of it now. Speaking of GTK+, it looks overwhelming at first, but it's manageable if you adopt an approach of just taking what you need and getting it to work (supplemented with liberal copy/paste of code strewn all over the internet). Yeah, I know: Transcript and Workspace? It's almost as if pLisp is a cover tribute to VisualWorks Smalltalk.